Danika and Joel are the first horse trainers I have worked with, and I consider it one of my luckiest fateful meetings. 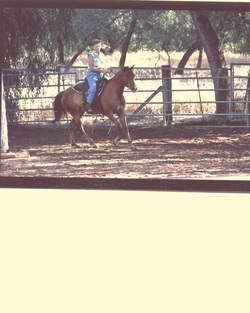 In fact, learning to ride a horse, and owning my own horse has been a lifelong dream. Now in my mid-fifties, I am finally living out this dream. I never stopped to think how I would know if i was working with a good trainer, but with years of experience in sizing up people, it did not take me long to know that I had found not only the best trainers for me, but two amazing seasoned horse people. Danika worked with me to find the best "first" horse, and now I have Almond who has taught me almost as much as Joel and Danika have taught me. 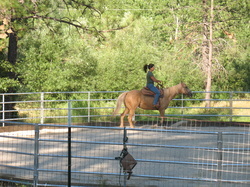 I would actually describe the lessons as Joel and Danika talking for Almond, as I am riding. In my lessons they have taught me everything from ground work, and how to care for Almond to finally realizing the amazing "partnership" with my horse when riding that I had only fantasized about for many years. I look forward to the coming year when they will help me shop for my next horse who will actually take me to the show ring, with their amazing training, and of course with the lessons continuing. "One thing that I think most horse people will agree upon is that it can be difficult to find someone you can trust when it comes to horse matters. As a newcomer to the horse world, I have made my share of mistakes. I first came to Danika because I had been told that my 11 yr old daughter, who loved to ride horses, shouldn't ever be around them. This was from a natural horseman trainer with whom we had spent over a year with doing Parelli groundwork on my 3 yr old mustang. I told Danika that I wanted my daughter to have a few lessons so that she wouldn't feel like a failure. Initially Danika and Joel put her on a very well mannered older horse. Her riding improved, but she didn't try very hard. Next, they had her try a horse that was a much bigger challenge. After the first lesson, she said she never wanted to ride that horse again. Danika and Joel encouraged her to keep going even though it was tough, and now, about ten months later, she has an incredible relationship with that horse and her riding skills have improved tremendously. And as for me, a 55 yr old woman who knew basically nothing about riding but got tired of just watching lessons, under Danika's watchful eye, my confidence and abilities have grown to the point that I am ready to be in my first walk-trot class in our local horseshow. Danika and Joel are both extremely talented riding teachers and horse trainers. They are always safety conscious and honest, and while not pushy, always encourage their students to learn more. They have taken an interest in my daughter and I above and beyond what I would have expected. I feel that we are very lucky to be learning from them." Lena is doing exceptionally well. I love her so much and she is everything I have been looking for. She’s perfect in every way, shape and form. She is so smart and talented and she has such a beautiful mind. She is curious and affectionate and loves to work and have her cookies. She is doing so well on her reining work, she is sliding an average of 4 feet on her good ones and she has a nice smooth spin started! She knows her leads very well and I have trotted her around barrels and I think she will excel at that with her clean mind and great attitude. I think she will exal at anything! My dad, mom, and little brother can all ride her with ease without worry. Thank you again so much for the wonderful gift. I know she will have a huge future and will take me far. We have bonded so well and I can’t wait to see what’s down the road. She surprises me every day with another talent she shows me. I should have done this sooner. 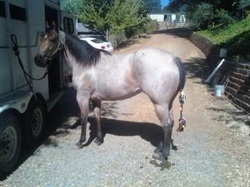 Thank you so much for the great job you did on my quarter horse,"Tater" (Tucker Cast A Shadow). The foundation start you did for Tater was so good. I rode her for a few times before sending her for more training. Never had a problem on the trails. The trainer had to just add to the work you had done with her. As a result she knows only positive training and has absolutely no unwanted behaviors. You do great work. 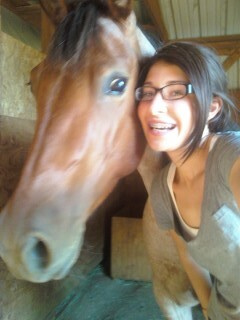 If I ever was to be looking for another horse, I would definitely go to you. 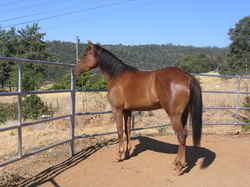 You have a great eye for a good horse and give them a great foundation to build on. "Tater" is doing great and is a wonderful trail buddy and arena pal. I feel lucky to have "Tater" in my life.